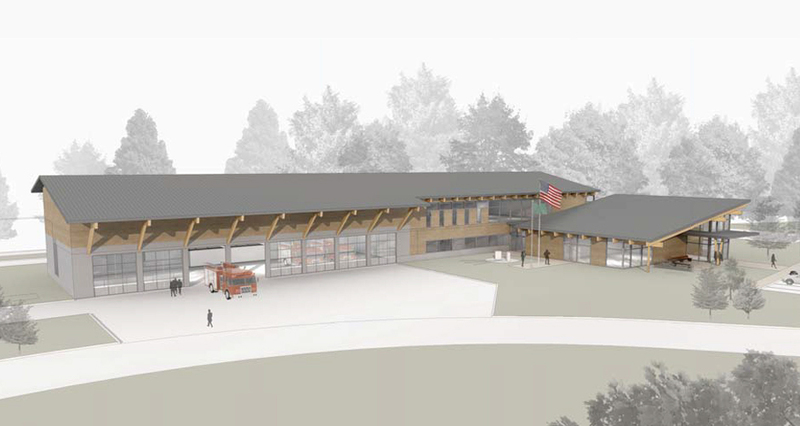 The Bainbridge Island Fire Department in collaboration with City of Bainbridge Island hired Mackenzie to conduct a study to evaluate their three existing fire stations and police station to determine what projects would be required to better meet the goals and future needs of the Fire and Police Departments. Mackenzie started the process by individually evaluating the four existing stations, noting items not in compliance with current building code (NFPA standards, WAC requirements, ADA accessibility, and energy code, structural). The design team closely examined systems and materials damaged and/or at or near the end of their useful life to determine if it was feasible to design and construct the improvements required to bring the existing structures into compliance with current code. 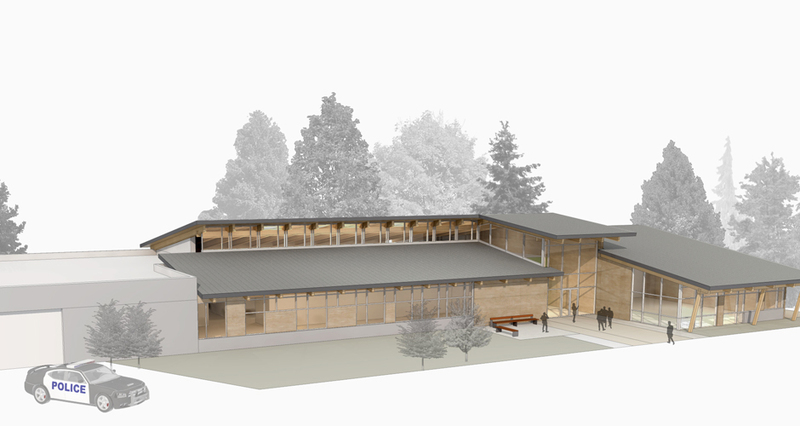 Then, Mackenzie worked with Fire and Police Department staff to define the space needs requirements for each facility. The design team analyzed projected growth, identifying adjacencies, and equipment needs to define a program for each facility with strong consideration given to the projected service requirements for each department. 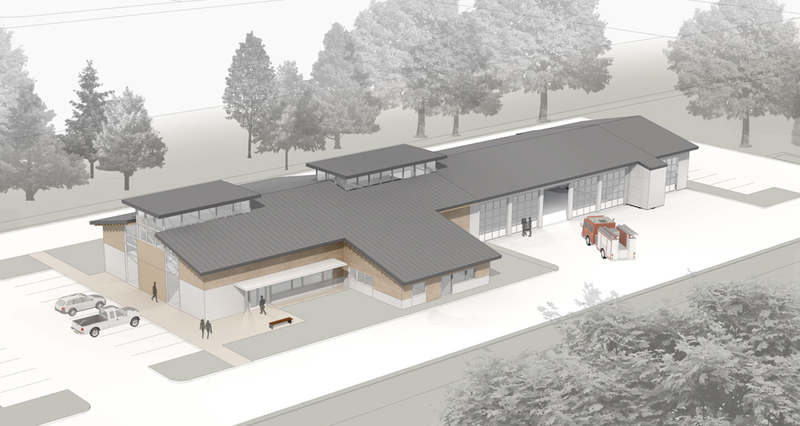 By defining the required improvements and associated costs, it was determined that it was not feasible to remodel Fire Stations 21, and 22, as well as the Police Station. It was however, determined that Fire Station 23 had significant useful life remaining. Only modest improvements such as expanded bay areas, kitchen, bunkrooms, and fitness room renovations were required for that facility. Mackenzie led three public outreach meetings to keep citizens informed and to solicit input at each step along the way. In addition, Mackenzie presented summaries of the findings to City Council and the Fire Commissioners at the conclusion of each phase of the study. 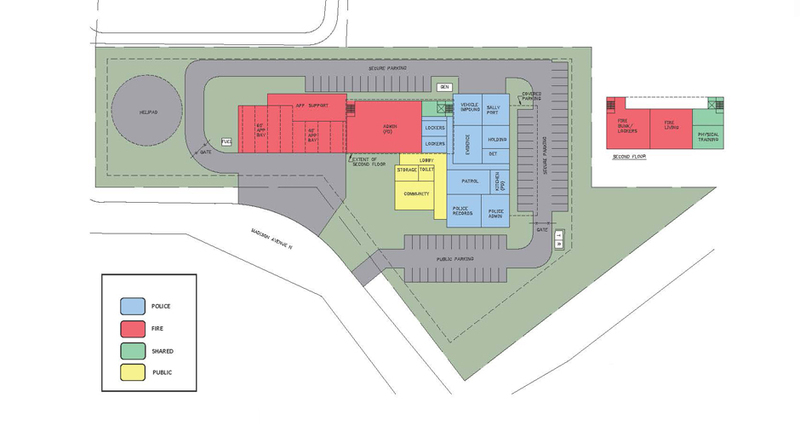 As part of the scope of this study, Mackenzie considered a strategy to develop a Joint Public Safety Campus combining both Fire Station 21 and the Police Station. 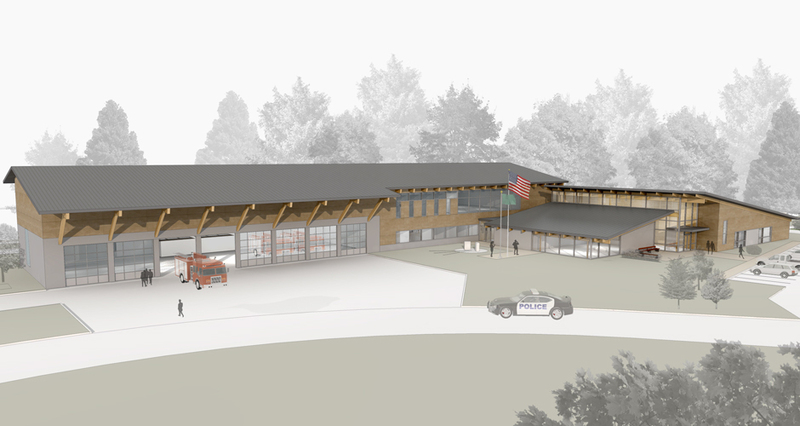 In addition, Mackenzie also developed concepts for “stand-alone” facilities for both the Police and Fire Departments located on separate sites. 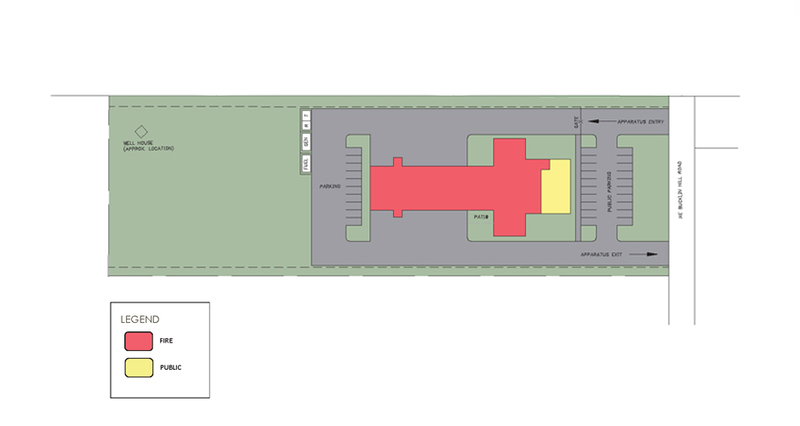 In the end, due to shape of the site, access points to/from site, setbacks and developable area and a number of other elements, it became clear that the optimum strategy was a Joint Public Safety Campus, in addition with the full replacement of Fire Station 22 and a remodel of Fire Station 23. 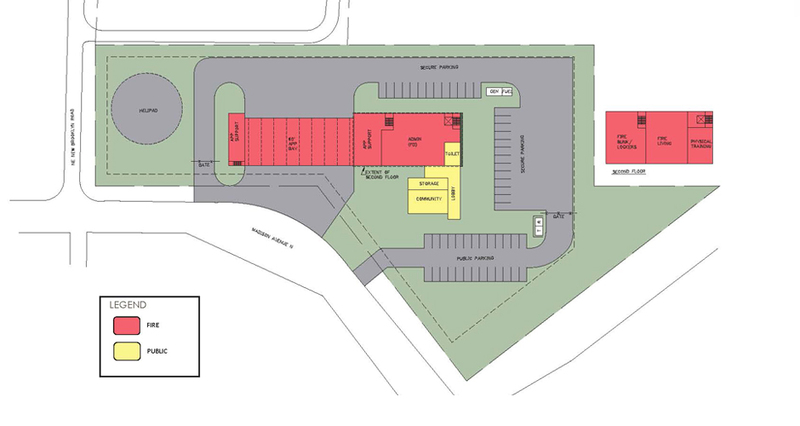 The Joint Public Safety Campus concept requires the removal of all of the existing structures at the current Fire Station 21 site. 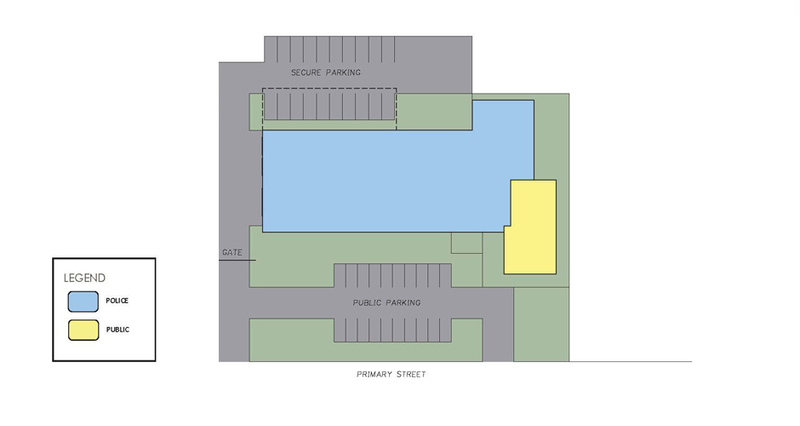 The proposed campus includes 40,044 SF of building space and 65 parking spaces for Fire/Police staff and the general public. A combined facility will enable both agencies to capitalize on needs and share space requirements rather than developing separate identical room/functions at separate facilities. The study revealed that sharing a site and building reduces the size of the overall facility in comparison to the size of individual police and fire facilities. As such, a combined public safety facility offers a cost savings. Additionally, the site can be developed to meet the long-term needs of both agencies and serve the community without having to purchase additional land.